Human placenta releases specific nanovesicles (i.e. exosomes) into the maternal circulation during pregnancy, however, the presence of placenta-derived exosomes in maternal blood during early pregnancy remains to be established. The aim of this study was to characterise gestational age related changes in the concentration of placenta-derived exosomes during the first trimester of pregnancy (i.e. from 6 to 12 weeks) in plasma from women with normal pregnancies. A time-series experimental design was used to establish pregnancy-associated changes in maternal plasma exosome concentrations during the first trimester. A series of plasma were collected from normal healthy women (10 patients) at 6, 7, 8, 9, 10, 11 and 12 weeks of gestation (n = 70). We measured the stability of these vesicles by quantifying and observing their protein and miRNA contents after the freeze/thawing processes. Exosomes were isolated by differential and buoyant density centrifugation using a sucrose continuous gradient and characterised by their size distribution and morphology using the nanoparticles tracking analysis (NTA; Nanosight™) and electron microscopy (EM), respectively. The total number of exosomes and placenta-derived exosomes were determined by quantifying the immunoreactive exosomal marker, CD63 and a placenta-specific marker (Placental Alkaline Phosphatase PLAP). These nanoparticles are extraordinarily stable. There is no significant decline in their yield with the freeze/thawing processes or change in their EM morphology. NTA identified the presence of 50–150 nm spherical vesicles in maternal plasma as early as 6 weeks of pregnancy. The number of exosomes in maternal circulation increased significantly (ANOVA, p = 0.002) with the progression of pregnancy (from 6 to 12 weeks). The concentration of placenta-derived exosomes in maternal plasma (i.e. PLAP+) increased progressively with gestational age, from 6 weeks 70.6 ± 5.7 pg/ml to 12 weeks 117.5 ± 13.4 pg/ml. 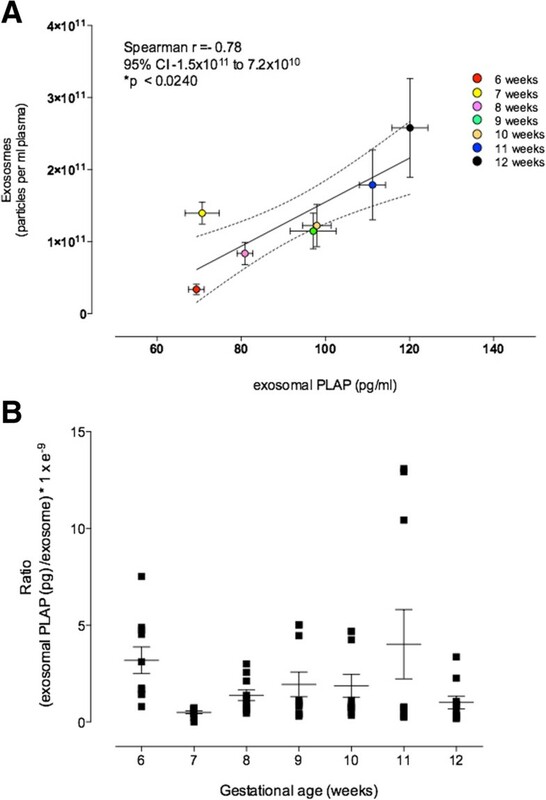 Regression analysis showed that weeks is a factor that explains for >70% of the observed variation in plasma exosomal PLAP concentration while the total exosome number only explains 20%. During normal healthy pregnancy, the number of exosomes present in the maternal plasma increased significantly with gestational age across the first trimester of pregnancy. This study is a baseline that provides an ideal starting point for developing early detection method for women who subsequently develop pregnancy complications, clinically detected during the second trimester. Early detection of women at risk of pregnancy complications would provide an opportunity to develop and evaluate appropriate intervention strategies to limit acute adverse sequel. The placenta plays a pivotal role in mediating maternal adaptation to pregnancy as well as regulating fetal growth and development. Pregnancy-induced changes are affected by the release of soluble autacoids as early as 6 to 8 weeks of gestation [1, 2] and the invasion of placental cells into the maternal tissues to modify maternal immune, cardiovascular and metabolic activities. Recently, we and others [3–7] have identified an additional pathway by which the placenta communicates with the maternal system to induce changes during pregnancy-placental exosomal signalling. Exosomes are bilipid membrane-bound nanovesicles (50–120 nm diameter) that are actively released (via exocytosis) from cells into the extracellular space and body fluids under physiological and pathophysiological conditions . Their molecular cargo of proteins, microRNAs, mRNAs and lipids appear to be selectively packaged by the late endosomal system to regulate the phenotype of target cells [3, 4, 6]. Recent studies have highlighted the putative utility of tissue-specific nanovesicles (e.g. exosomes) in the diagnosis of disease onset and treatment monitoring [4, 9, 10]. Previously, we have established that placental cells release exosomes in response to changes in the extracellular milieu (including oxygen tension and glucose concentration) and that placental cell-derived exosomes regulate target cell migration and invasion [3, 4]. In addition, we have identified placental-derived exosomes in maternal blood and reported that the concentration of placental exosomes in the maternal blood increases during normal, healthy pregnancy . During early placentation, the cytotrophoblast cells form a highly invasive extravillous trophoblast that can migrate into the decidua and invade the first third of the myometrium, inducing remodelling of spiral arterioles to produce low-resistance vascular system, essential for fetal development . The relative reduction of utero-placental flow caused by abnormal placentation triggers the development of placental originated diseases such as preeclampsia. Available data suggest that the concentrations of placental-derived exosomes in the maternal blood could be a potential marker of abnormal placentation [12, 13]. Early detection of disease risk and onset is the first step in implementing efficacious treatment and improving patient outcome. To date, the concentration profile of placenta-derived exosomes in the maternal blood during first trimester has not been established. Until this profile is defined, the utility of placental exosomes as an early biomarker for placental dysfunction will remain equivocal. In this study, therefore, a time-series experimental design was used to test the hypothesis that the concentration of placental exosomes in the maternal plasma of normal healthy women changes during the early pregnancy state (i.e. 6–12 weeks). A time-series experimental design was used to establish the variation in plasma exosome characteristics during normal pregnancy. All experimental procedures were conducted within an ISO17025 accredited (National Association of Testing Authorities, Australia) research facility. All data were recorded within a 21 CERF part 11 compliant electronic laboratory notebook (Iris note, Redwood City, CA, USA). Plasma samples were collected from 10 women during their first trimester of pregnancy. All patients were enrolled with informed consent and underwent routine obstetrical care at the Hospital Parroquial de San Bernardo (Santiago, Chile). Estimation of gestational age was made based on the first day of their last menstrual period and confirmed by transvaginal ultrasound at the recruitment (i.e. 6 weeks). Each patient, gave consent to have weekly blood sample collection between 6 and 12 weeks of gestation (n = 70, 10 patients with weekly blood collection at 6, 7, 8, 9, 10, 11 and 12 weeks of pregnancy). The protocol of the study was approved by the Institutional Review Board of the Universidad de los Andes (Santiago, Chile). Obstetrical history and physical findings were recorded regarding previous spontaneous abortions, course of previous pregnancies, hypertension, gestational diabetes and preeclampsia. Peripheral venous blood samples were collected in EDTA treated tubes (BD Vacutainer® Plus plastic plasma tube) from which plasma samples were obtained by centrifugation at 2000 × g at 4°C for 10 min. The plasma samples were stored in aliquots at −80°C until analysed (not more than three months). Exosomes were isolated as previously described [3, 4, 7, 14]. Briefly, plasma from each patient was utilised to isolate exosomes. Plasma (2.5 ml) was diluted with equal volume of PBS (pH 7.4) and exosomes were isolated through differential centrifugation, microfiltration and buoyant density ultracentrifugation. Centrifugation was initially performed at 2,000 × g at 4°C for 30 min (Thermo Fisher Scientific Ins., Asheville, NC, USA, Sorvall®, high speed microcentrifuge, fixed rotor angle: 90°) followed by 12,000 × g at 4°C for 45 min to sediment cell nuclei, mitochondria and debris. The supernatant fluid (~5 ml) was transferred to an ultracentrifuge tube (Ultracrimp tubes, Thermo Fisher Scientific Ins., Asheville, NC, USA) and was centrifuged at 200,000 × g at 4°C for 2 h (Thermo Fisher Scientific Ins., Asheville, NC, USA, Sorvall®, T-8100, fixed angle ultracentrifuge rotor). The pellet was suspended in PBS (5 ml) and filtered through a 0.22 μm filter (SteritopTM, Millipore, Billerica, MA, USA). The filtrate was centrifuged at 200,000 × g at 4°C for 70 min (Thermo Fisher Scientific Ins., Asheville, NC, USA, Sorvall®, T-8100, fixed angle ultracentrifuge rotor) and the pellet resuspended in 2.5 M sucrose (4 ml). The resuspended 200,000 g pellet in 2.5 M sucrose was added at the bottom of an ultracentrifuge tube. A continuous sucrose gradient (26 ml; 0.25-2.5 M) was made above 4 ml of exosome suspension using a Hoefer SG30 gradient maker (GE Healthcare, NSW, Australia) and centrifuged at 110,000 g for 20 h (Sorvall, SureSpin™ 630/360, Swinging-Bucket ultracentrifuge rotor). Fractions (10 in total, 3 ml each) were collected automatically using a Pulse-Free Flow Peristaltic Pump with a flow rate range of 3 ml per min (GILSON Miniplus® model 3) and the Fraction Collector (GILSON FC 203B model). The density of each fraction was determined using the refraction index with OPTi digital refractometer (Bellingham + Stanley Inc., Lawrenceville, GA, USA). The coefficient of variation (CV) was less than 8% for the density of each fraction. Fractions (3 ml each) were diluted in PBS (60 ml) and then centrifuged at 200,000 × g for 70 min. The 200,000 g pellet was resuspended in 50 μl PBS and stored at −80°C. Exosomal protein concentrations were determined by a colorimetric assay (DC™ Protein Assay, Bio-Rad Laboratories, Hercules, CA, USA) . NTA measurements were performed using a NanoSight NS500 instrument (NanoSight NTA 2.3 Nanoparticle Tracking and Analysis Release Version Build 0033) following the manufacturer’s instructions. The NanoSight NS500 instrument measured the rate of Brownian motion of nanoparticles in a light scattering system that provides a reproducible platform for specific and general nanoparticle characterization (NanoSight Ltd., Amesbury, United Kingdom). Samples were processed in duplicates and diluted with PBS over a range of concentrations to obtain between 10 and 100 particles per image (optimal ~50 particles x image) before analysing with NTA system. The samples were mixed before introducting into the chamber (temperature: 25°C and viscosity: 0.89 cP) and the camera level set to obtain image that has sufficient contrast to clearly identify particles while minimizing background noise a video recording (camera level: 10 and capture duration: 60 s). The captured videos (2 videos per sample) were then processed and analysed. A combination of high shutter speed (450) and gain (250) followed by manual focusing enabled optimum visualization of a maximum number of vesicles. We included a minimum of 200 tracks completed per video in duplicates. NTA post acquisition settings were optimized and kept constant between samples (Frames Processed: 1496 of 1496, Frames per Second: 30, camera shutter: 20 ms; Calibration: 139 nm/pixel, Blur: 3×3; Detection Threshold: 10; Min Track Length: Auto; Min Expected Size: Auto), and each video was then analyzed to give the mean, mode, and median particles size together with an estimate of the number of particles. An Excel spreadsheet (Microsoft Corp., Redmond, Washington) was also automatically generated, showing the concentration at each particle size. For the TEM analysis, exosome pellets (as described above, 30 μg protein) were fixed in 3% (w/v) glutaraldehyde and 2% paraformaldehyde in cacodylate buffer, pH 7.3. Exosome samples were then applied to a continuous carbon grid and negatively stained with 2% uranyl acetate. The samples were examined in an FEI Tecnai 12 transmission electron microscope (FEI™, Hillsboro, Oregon, USA) in the Central Analytical Research Facility, Institute for Future Environments, Queensland University of Technology (QUT) (see Acknowledgements). The concentration of exosomes in maternal circulation was expressed as the total immunoreactive exosomal CD63 (ExoELISA™, System Biosciences, Mountain View, CA). Briefly, 10 μg of exosomal protein was immobilised in 96-well microtiter plates and incubated overnight (binding step). Plates were washed three times for 5 min using a wash buffer solution and then incubated with exosome specific primary antibody (CD63) at room temperature (RT) for 1 h under agitation. Plates were washed and incubated with secondary antibody (1:5000) at RT 1 h under agitation. Plates were washed and incubated with Super-sensitive TMB ELISA substrate at RT for 45 min under agitation. The reaction was terminated using Stop Buffer solution. Absorbance was measured at 450 nm. The number of exosomes/ml, (ExoELISA™ kit) was obtained using an exosomal CD63 standard curve calibrated against nanoparticle tracking data (i.e. number of exosomes, NanoSight™). For placental cell-derived exosomes, the concentration of exosomal PLAP was quantified using a commercial ELISA kit (MYBioSource MBS701995, San Diego, CA, USA) according to manufacturer’s instructions (detection range: 84–2000 pg/ml; sensitivity: 34 pg/ml; intra-assay precision within an assay: CV% < 10%; inter-assay between assays: CV% < 15%) Briefly, 10 μg of exosomal protein was added to each well of a 96-well microtitre plate and incubated at 37°C for 30 min. Plates were washed three times while shaking for 20 s and 50 μl of HRP-conjugate was added to each well and incubated at 37°C for 20 min. Plates were washed and incubated with 50 μl of substrate A and 50 μl of substrate B at 37°C for 15 min. The incubation was terminated using 50 μl of stop solution at RT for 2 min under agitation. Absorbance was measured at 450 nm. Exosomal PLAP was expressed as pg PLAP /ml plasma. To determine the stability of the exosomes during freeze-thaw cycles, fresh plasma (5.0 ml) from healthy women were obtained and divided into two 2.5 ml samples (A and B). Exosomes were immediately isolated from the first aliquot (A: fresh plasma) by differential and buoyant density centrifugation and then characterised by the number of exosome particles using an ELISA kit (ExoELISA™, System Biosciences, Mountain View, CA), morphologically by electron microscope, microRNA content by real time PCR and protein profiling by mass-spectrometry. Sample B plasma was stored at −80°C for 2 months (B: frozen plasma), prior to exosome isolation and characterisation. miRNA isolation: miRNA were isolated from exosome particles as we have previously described . Ambion mirVana PARIS Kit (Invitrogen, USA) was used to extract exosomal total RNA from fresh and frozen plasma by following the manufacturer’s procedure. Exosomes were first lysed by adding cell disruption buffer and vortexed or pipetted vigorously. Denaturing solution was added to samples and incubated on ice for 5 min. The first two steps stabilize RNA and inactivate RNases. The lysate is then subjected to Acid-Phenol:Chloroform extraction by adding Acid-Phenol:Chloroform, vortexed and centrifuged at 10,000 × g for 5 min. Recovery of the aqueous phase obtains semi-pure RNA samples, removing most of the other cellular components. 100% ethanol was mixed and passed through a filter cartilage. The filter was washed three times and the RNA was eluted with nuclease-free water. Real-time PCR: Reverse transcription was performed using the miScript Reverse Transcription Kit (QIAGEN, Valencia, CA, USA) in a total volume of 20 μl. cDNA was synthesised from the maximum volume of exosomal RNA (12 μl) using the BIO-RAD T100™ Thermal Cycler (USA) running for 60 min at 37°C, 5 min for 95°C and 60 min for 37°C. As the control, RNase-free water was added as the RNA template. Real-time PCR was performed with miScript SYBR Green Kit (QIAGEN, Valencia, CA, USA). Forward primers (miScript primer assays, QIAGEN, Valencia, CA, USA) designed to detect the housekeeping gene, human RNU6-2 (RNU6B) was used. The reactions were performed in triplicate using the BIO-RAD iQ™5 Multicolor Real-Time PCR Detection System (USA) with the following conditions: 94°C for 3 min, 35 amplification cycles of 94°C for 45 s, 55°C for 30 s and 72°C for 30 s, 72°C for 10 min, 12°C for ∞ min. Proteomic analysis of exosomes by mass spectrometry (MS): We utilised a Liquid Chromatography (LC) and Mass Spectrometry (MS) LC/MS/MS instrumentation available within the University of Queensland Centre for Clinical Research (5500qTRAP and 5600 Triple TOF) to undertake in depth quantitative proteomic analysis of the exosome samples (isolated from fresh and frozen plasma) to determine the proteome of exosomes as we have previously published . Briefly, exosomes were adjusted to 8 M urea in 50 mM ammonium bicarbonate, pH 8.5, and reduced with tris (2-carboxyethyl) phosphine (5 mM) at room temperature for 1 h. Proteins were then alkylated in 10 mM IAA for 1 h in the dark. The sample was diluted 1:10 with 50 mM ammonium bicarbonate and then digested with trypsin (20 μg) at 37°C for 18 h. The samples were dried by centrifugal evaporation to remove the acetonitrile and then redissolved in Solvent A. The digested protein samples were analysed using a 5600 Triple TOF mass spectrometer (ABSciex) to obtain initial high mass accuracy survey MS/MS data, identifing the peptides present in the samples. The in depth proteomic analysis was performed using the Information Dependent Acquisition (IDA) experiments on the 5600 Triple TOF MS and utilized an enhanced MS survey scan (m/z350–1500) followed by 50 data-dependent product ion scans of the 50 most intense precursor ions. The MS data was analysed with the Markerview software package using Principal Components Analysis (PCA) or PCA-Discriminate Analysis (PCA-DA) which compares data across multiple samples, groupings the data sets, and graphically showing the groups in a Scores plot. The Loadings plot provides valuable insight into variables that lead to sample clustering and illustrates which biomarkers are up- or down-regulated. All mass spectra were analysed using the Mascot and Protein Pilot search engines against the Swissprot-swissprot database with the species set as human (scores greater than 30). False discovery rate (FDR) was estimated using a reversed sequence database. Finally, proteins identified were submitted to bioinformatic pathway analysis (Ingenuity Pathway Analysis [IPA]; Ingenuity Systems, Mountain View, CA; http://www.ingenuity.com). Data are presented as mean ± SEM, with n = 10 different patients per group (i.e. 6, 7, 8, 9, 10, 11, 12 weeks). The effect of gestational age on number of exosome particles and placental-derived exosomes were assessed by two-way ANOVA, with variance partitioned between gestational age and subject. Statistical difference between group means was assessed by Dunn’s test to compare each treatment to the control group where the data distribution approximates normality and by Mann–Whitney U-test for distribution independent data analysis. Two group means were statistically assessed by Student’s t-test. Statistical significance was defined as p < 0.05. 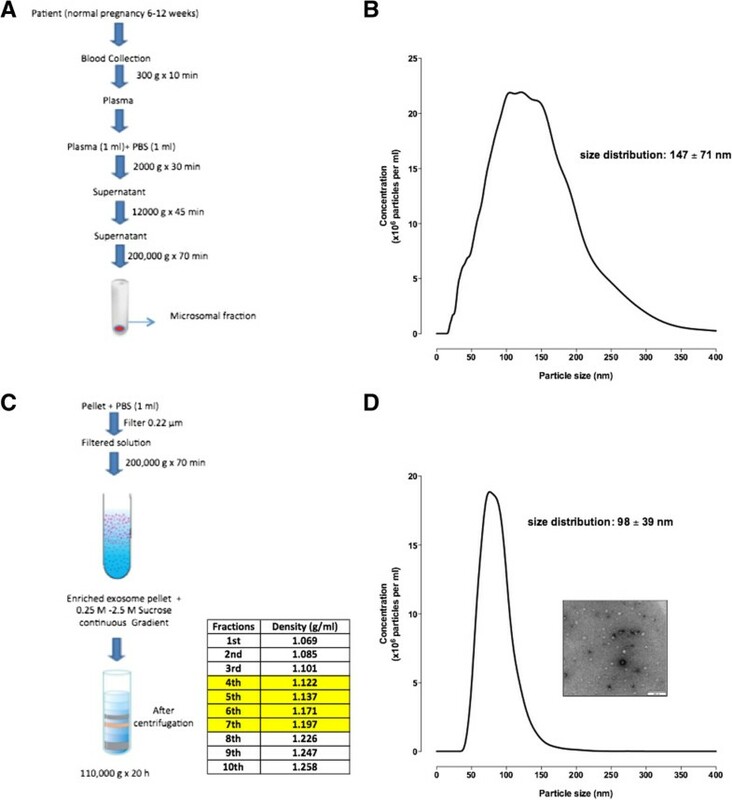 Maternal plasma exosomes isolated by differential and sucrose density gradient centrifugation were characterised by a buoyant density of 1.122 to 1.197 g/ml (fractions 4 to 7) (Figure 1A-D). Nanoparticle tracking analysis showed a particle size distribution of 200,000 × g pellet (Figure 1A) ranging from 30 to 300 nm in diameter corresponding to microsomal fraction (including exosomes particles) with an average of 147 ± 71 nm (mean ± SD) (Figure 1B). After the sucrose continuous gradient, we mixed the enriched exosomal fractions (1.122 to 1.197 g/ml) (Figure 1C) and obtained a particle size distribution ranged from 50 to 140 nm in diameter, with an average of 98 ± 39 nm (mean ± SD) (Figure 1D). Electron microscopy revealed the presence of spherical vesicles, with a typical cup-shape and diameters ranging from 30 to 120 nm (Figure 1D, insert). Characterisation of exosome from maternal circulation. Exosome were isolated from women uncomplicated pregnancies during first trimester by differential and buoyant density centrifugation (see Methods). (A) Flow chart for the exosome purification procedure based on differential ultracentrifugation. (B) Representative particles size distribution of microsomal fraction. (C) Flow chart for the exosome purification procedure based on sucrose continuous gradient (exosome enriched fractions in yellow 4–7). (D) Representative particles size distribution of enriched exosomal fractions (fraction 4–7 were mixed). Insert: Representative electron micrograph exosome fractions (pooled enriched exosome population from fractions 4 to 7), Scale bar 200 nm. The stability of exosomes after a freeze and thaw cycle was evaluated using fresh and frozen plasma. No significant difference was observed using fresh or frozen plasma in exosome quantification, exosomal marker expression, microRNA expression or protein content (Figure 2A-D, Table 1). Characteristics of exosomes isolated from plasma immediately after phlebotomy (○) and after 30 days stored at −80°C (●). (A) Number of exosome particles. (B) Exosomes characterization. b1: electron microscope (scale bar 100 nm) and b2: Western blot for CD63 (exosomal marker); lane 1: Fresh and lane 2: stored. (C) Expression of miRNA RNU6B in exosomes. (D) Venn diagram of proteins identified in fresh and stored exosomes. List of common exosomal proteins are presented as Protein ID, Symbol, Entrez Gene Name, Location and type. No significant differences were observed en exosomal protein content from fresh or frozen plasma (coefficient of variation < 5%) after different freeze thawing cycle from the same sample. Pooled exosome-containing fractions (i.e. fractions 4 to 7) were further characterised by determining the number of exosome (NEP) and exosomal PLAP concentration in the serial samples of maternal plasma obtained during first trimester of pregnancy (i.e. 6–12 weeks). 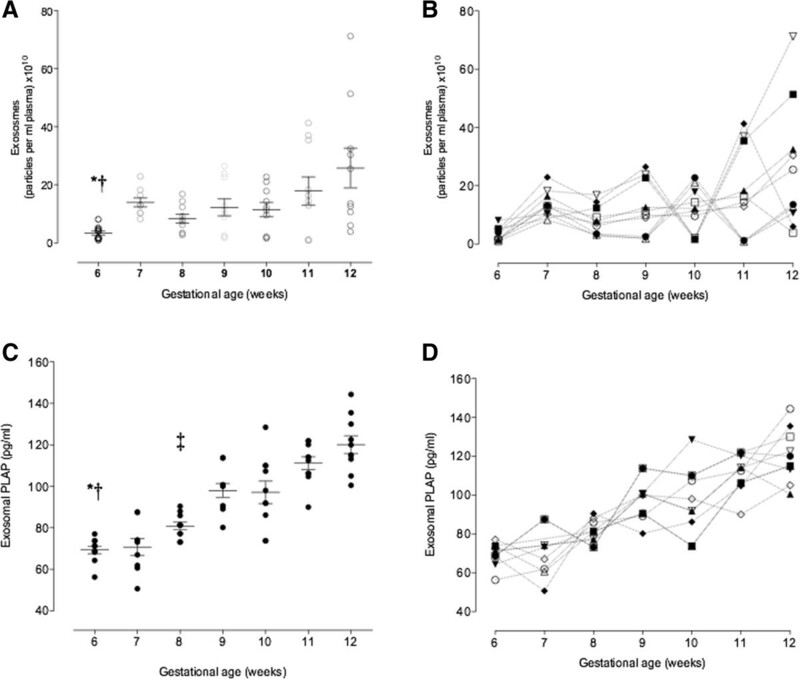 The gestational age variation in plasma exosome number was analysed by two-way ANOVA with the variance partitioned between gestational age and subject. A significantly effect of gestational age was identified (n = 69, one missing value, p < 0.005). A post-hoc multiple range test was used to identify statistically significant (p <0.05) differences between pairwise comparisons (Figure 3A). In addition, a significant effect of subject was identified (n = 69, one missing value, p < 0.05) (Figure 3B). In addition, NEP and gestational age (i.e. 6–12 weeks) displayed a significant positive linear relationship (r2 = 0.202, p < 0.001, n = 69, one missing value). Exosome profiling across first trimester pregnancy. Enriched exosomal population (i.e. number of exosome particles) and placenta-derived exosomes (i.e. exosomal PLAP) were quantified in in peripheral plasma of women in the first trimester of pregnancy by ELISA. (A) exosomes as particles per ml plasma. (B) individual variation in exosome number for each week (C) exosomal PLAP during first trimester of pregnancy (i.e. 6–12 weeks). (D) individual variation in exosomal PLAP for each week. Data are presented as aligned dot plot and values are mean ± SEM. In A, two-way ANOVA **p = 0.0048, Dunn’s post-hoc test analysis = *p < 0.05 6 vs. 7 weeks and † p < 0.005: 6 vs. 12 weeks. In C, two-way ANOVA ***p < 0.0001, Dunn’s post-hoc test analysis = *p < 0.05 6 vs. 9 and 10 weeks, † p < 0.005: 6 vs. 11 and 12 weeks, and ‡ p < 0.005: 8 vs. 11 and 12 weeks. To assess gestational variation in placenta-derived exosomes, exosomal immunoreative (IR) PLAP was quantified using a commercial ELISA kit (see Methods). IR exosomal PLAP concentrations were analysed by two-way ANOVA with the variance partitioned between gestational age and subject. A significant effect of gestational age was identified (p < 0.0001, n = 69, one missing value) (Figure 3C). A post-hoc multiple range test was used to identify statistically significant (p <0.05) differences between pairwise comparisons (Figure 3D). No significant effect of patient on exosomal PLAP concentration was identified (p = 0.123). Immunoreactive exosomal PLAP concentration and gestational age displayed a significant positive linear linear relationship (r2 = 0.711, p < 0.001, n = 69, one missing value). Exosomal PLAP concentration and exosome number were subjected to linear regression analysis. The fitted linear model was described by the following equation: plasma exosomal PLAP pg/ml = 85.6 + 5.47 × 10−11 × exosome number/ml (p < 0.006, n = 69, one missing pair). The coefficient of determination (r2) was 10.8 (Figure 4A). Contribution of placental-derived exosomes into maternal circulation. (A) Relationship between exosomal PLAP and exosomes (particles per ml plasma) across first trimester of pregnancy (i.e. 6–12 weeks represented by colours). (B) Ratio of specific placental exosome and exosomes. In A, values are mean ± SEM, Linear correlation (−). In B, Data are presented as aligned dot plot and values are mean ± SEM, two-way ANOVA p > 0.05. To estimate changes in the relative contribution of placental exosomes within the total exosomes present in maternal plasma and identify changes over the gestational age, the apparent PLAP content per 109 exosome (PLAP ratio) was determined. Overall PLAP ratio averaged 2.01 ± 0.33 × 10−9 exosomal PLAP (pg) per exosome. The effects of gestational age on PLAP ratio were assessed by Kruskal-Wallis one-way ANOVA. No significant effect of gestational age on PLAP ratio was identified (p = 0.06) (Figure 4B). Currently, there are no proven means of identifying presymptomatic women who subsequently develop complications of pregnancy during early pregnancy. Most women who are triaged into high-risk clinical units based on previous poor obstetric history ultimately have uncomplicated pregnancies. Available evidence supports the hypothesis that the aetiology of pregnancy complications begins during 1st trimester [15, 16]. If this is the case, profile of placenta-derived biomarkers during early pregnancy may be common between women with risk of developing pregnancy complications. Identification of such characteristics would provide opportunity to develop clinically useful early pregnancy screening tests. Previously we have established that normal pregnancy is associated with the increase of exosomes into maternal plasma and the concentration of placenta-derived exosomes increases by 6-fold in uncomplicated healthy pregnancy during the first to third trimester  , however, the exosome profile in early pregnancy (i.e. from 6 to 12 weeks) remained to be established. The aim of this study was to characterise placenta-derived exosomes in maternal plasma over the first trimester of pregnancy and observe inter-subject variations in the exosome concentration. Weekly collected blood samples (from 6 to 12 weeks) were collected from normal healthy women to isolate and characterise the exosomes. The presence of exosomes were confirmed by: size (50–120 nM), and buoyant density (1.122- 1.197 g/ml). Endosomal (CD63) and placental (PLAP) antigens were identified in maternal plasma from as early as sixth week of pregnancy. The number of exosomes present in the maternal plasma increased progressively during the first trimester, as well as the exosomal PLAP concentration. We isolated exosomes from the maternal plasma by differential and buoyant density centrifugation using a sucrose continuous gradient [7, 17]. The purification of exosomes from plasma and other biological fluids is not trivial, however, the use of an automatic system for fraction collection after the sucrose continuous gradient enable a high-reproducibility density, and decreasing the coefficient of variation between samples. In addition, using purification method based on the density of exosomes discards vesicles with the same size of exosomes with no endosomal origin, increasing the purity of exosome samples. Previous studies have established that extracellular vesicles, including exosomes are released under physiological and pathophysiological conditions as well as during gestation . The release of these vesicles is increased during pregnancy in response to different pathological conditions, presumably due to exosomal secretion from the placental trophoblast cells to the maternal peripheral circulation [19, 20]. In this study, we have established that exosomes are very stable when stored at −80°C. We obtained similar exosome yield from fresh and stored samples (i.e. plasma) and were able to identify gestational age differences in plasma exosome number in samples stored in long term. The isolation of exosomes from stored biofluids is the normal rather than the exception. These results are consistent with those of other studies [21, 22] suggesting that the exosomal content is protected inside these vesicles, highlighting the potential use of exosomes as biomarker for their high stability under different conditions. As exosomes carry different kinds of protein, mRNA and miRNA , engaging in cell-to-cell communication, it is likely that they play an important role in modifying the maternal physiological state to maintain a successful pregnancy . Interestingly, in this study we found that placental-derived exosomes increased systematically during the first trimester as early as sixth week of pregnancy when the intervillous circulation is not fully established. However, it has been observed that communication between placental and fetal circulation occurs at the beginning of the fourth week post conception . Moreover, the lacunar spaces are formed in the trophoblast from as early as nine days post-ovulation and maternal blood flows into the trophoblast lacunae between ten and eleven days after fecundation. In addition, it has been reported that the intervillous blood flow is present in an early stage (i.e. < seventh week)  and increases gradually from fourth week during the first trimester of pregnancy . Trophoblast plugs occlude the spiral arteries to prevent the contact of maternal blood flow into the intervillous space, however, at the same time trophoblast plug are in contact with the maternal blood, and could releases soluble proteins (e.g. human chorionic gonadotropin, hCG) and vesicles (e.g. nanovesicles) into maternal circulation. Interesting to highlight that hCG can be measured in maternal plasma as early as 4 weeks of gestation, confirming the presence of molecules released from the trophoblast in early pregnancy. Moreover, β-hCG and pregnancy-associated plasma protein A (PAPP-A) have been measured in maternal plasma as early as 6 weeks of gestation . Specific placental-derived exosomes were quantified in the maternal circulation using the immunoreactive placental protein PLAP. Recent studies have demonstrated the presence of exosomes-PLAP+ive only in peripheral circulation of pregnant women [7, 29]. PLAP is an integral membrane protein (enzyme) unique to the placenta (it has also been observed in some gynaecologic cancers), produced mainly by syncytiotrophoblast [30, 31]. Nevertheless, PLAP expression has been found in primary trophoblast cytotrophoblast cells  and ED27 trophoblast-like cells, both isolated from first trimester chorionic villi, and also in JEG-3 cells (a extravillous trophoblast model) . In addition, using immunohistochemistry stain for PLAP, the majority of chorionic trophoblastic cells were positive for PLAP . During the first trimester of pregnancy, the release of placental exosomes into the maternal blood may result from extravillous trophoblast and/or syncytiotrophoblast cells; however, while a definitive answer awaits further investigation, it is of relevance to note that fetal cells are present in maternal blood from 4 weeks of pregnancy and that trophoblast cells invade the decidua and myometrium from the time of implantation. Thus, a cellular and exosomal pathway exists for delivery into the maternal circulation. Recently, several attempts and techniques were undertaken to determine and characterize the exosomal content in different biological fluids including normal human blood plasma [34–36]. As, the content of these released exosomes are placenta- specific , studying these nanovesicles is excellent method to understand the different processes occurring during embryo/fetal development and the feto-maternal interaction. Exosome analysis provides diagnostic and therapeutic potential, and biomarker opportunities for the early detection of diseases [38–40]. To date, several research studies have been performed to identify the morphologic and proteomic characteristics of exosomes released from the placental extravilous trophoblast cells and expression profile of these exosomal contents relates to common pregnancy conditions [8, 41, 42]. However, all these studies considered the late second or third trimester of pregnancy plasma samples for analysis. In conclusion, this study present longitudinal data on placental-derived exosomes in the first trimester of pregnancy, starting from as early as 6 weeks after implantation. Early detection of women at risk of complications of pregnancy would provide opportunity to evaluate appropriate intervention strategies to limit acute adverse squeal. The rationale for developing early pregnancy screening tests is not only for the management of the contemporaneous pregnancy but also to optimise lifelong and intergenerational health. If this can be achieved, it will provide an opportunity for early assignment of risk and the implementation of an alternative clinical management strategy to improve outcome for both the mother and baby. We acknowledge the assistance of Dr. Jamie Riches and Dra. Rachel Hancock of the Central Analytical Research Facility, Institute for Future Environments, Queensland University of Technology (QUT) for the electron microscope analyses. This project was supported, in part by funding from Therapeutics Innovation Australia. SS, KSR, and CS contributed in generating experimental data. CS, MDM and GER contributed in discussion and reviewed/edited manuscript. AP and SEI contributed obtaining clinical samples and management of patients. SS, CS and GER wrote the manuscript and drew the figures. All authors read and approved the final manuscript.